Benchmade Model 551 Griptilian, Modified Drop Point. Design by knife maker Mel Pardue. Handle are lightweight, injection molded black Noryl GTX with textured surface and rib covered spine. 410 Stainless steel liner. Axis lock mechanism and reversible pocket clip that will fasten on either side for right or left side carry. 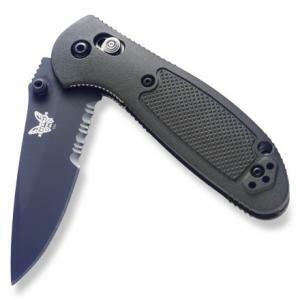 The first lightweight folder with Dual thumbstuds. Дизайнер – Mel Pardue, вот его несколько работ на knifeart.
. Настоящая надежность и практичность, мой вывод.